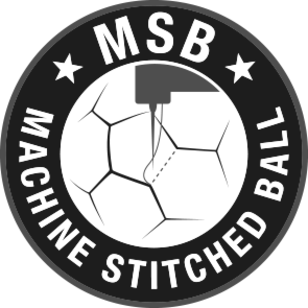 The machine stitched soccer balls are very similar to our hand-stitched ones. During production, the soccer ball panels are sewn together with a special sewing machine and a fine thread. Only soft, foamed materials can be used. The seam pattern is uneven, and the finishing stitching is always done by hand. While the end result does not reach the level of our hand-stitched soccer balls, a solid soccer ball is produced nevertheless.